In addition to its main web site at unicef.org, UNICEF maintains a separate web site at childinfo.org with a wide range of statistics on issues related to children and women. In the area of education, the Childinfo web site provides a complete set of country profiles with current statistics for 206 countries and territories, from Afghanistan to Zimbabwe. Complete profiles have three sections, with past trends, the current state of the education system, and prospects for 2015. The section on trends contains up to six graphs with data from 1980 to the present. The section on the current state of the education system lists up to two tables and six graphs. For countries with household survey data, two final graphs show school attendance rates between 2000 and 2015, the target year for the UN Millennium Development Goals. The level of detail of the country profiles varies, depending on the availability of education statistics for each country. 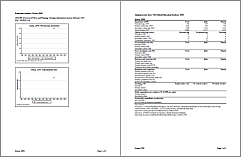 The profile for North Korea, shown in Figure 1, has only two pages and contains virtually no data. 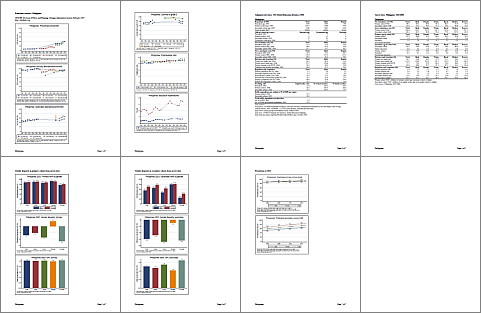 In contrast, the country profile for the Philippines, shown in Figure 2, has seven pages with fourteen graphs and two tables and provides data for all indicators listed above. Source: UNICEF Childinfo web site, childinfo.org, March 2007. On the Childinfo web site, all countries are grouped by UNICEF region. The majority of the data in the country profiles is from the UNESCO Institute for Statistics and from MICS and DHS surveys. affected by crises like HIV/AIDS and military conflict. In Nepal, the primary school net enrollment rate (NER) of girls was historically below 70 percent and much lower than the NER of boys, with a gender gap above 10 percent. Nepal also suffers from the consequences of a long-running Maoist insurgency. Two other criteria are not met by Nepal. The country is not on the list of countries covered by the Fast Track Initiative, and the number of girls out of school is below 1 million. A recent publication by UNICEF and the UNESCO Institute for Statistics, Children out of school: Measuring exclusion from primary education, estimates that around 500,000 girls and 400,000 boys of primary school age were not attending school in Nepal. Trend data on enrollment and attendance, plotted in the following graph, shows that the primary school participation rate of girls has increased substantially since the 1980s. On the other hand, the participation rate of boys has remained relatively stable. As a result, the difference between male and female enrollment or attendance rates has decreased from more than 40 percent to roughly 10 percent over the past 25 years. Data sources: UNESCO Institute for Statistics, Demographic and Health Survey, Multiple Indicator Cluster Survey, Nepal Living Standards Survey. The graph combines data from a variety of sources. UIS 1980-1997: UNESCO Institute for Statistics. 1999. Online database. http://www.uis.unesco.org/en/stats/centre.htm, March 2005. EFA: UNESCO. 2000. Education for All 2000 assessment: A decade of education. Paris: UNESCO Institute for Statistics. CD-ROM. UIS 1999-present: UNESCO Institute for Statistics. 2006. Global education database. http://stats.uis.unesco.org/ReportFolders/reportfolders.aspx, October 2006. DHS: Demographic and Health Survey 1996 and 2001. ORC Macro. http://www.measuredhs.com. MICS: Multiple Indicator Cluster Survey 2000. UNICEF. http://www.childinfo.org. NLSS: Central Bureau of Statistics [Nepal]. 2004. Nepal living standards survey 2003/04: Statistical report. 2 vols. Vol. 1. Kathmandu: Central Bureau of Statistics. The data from UNESCO measures primary school enrollment, the data from the three household surveys - DHS, MICS, and NLSS - measures primary school attendance. The net enrollment rate (NER) is the share of children of primary school age that are enrolled in primary school. The net attendance rate (NAR) is the share of children of primary school age that attend primary school. The official primary school age in Nepal is 5 to 9 years. In spite of some differences, the overall trends in enrollment and attendance are similar. 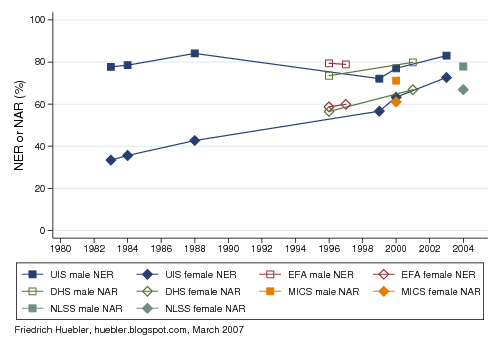 Male NER or NAR values have hovered around 80 percent since the 1980s. In 1983, the NER of boys was 78 percent; in 2003, it was 83 percent. The latest data on primary school attendance is from a Nepal Living Standard Survey (NLSS) conducted in 2003/04. For boys, the net attendance rate at that time was 78 percent. The female primary school NER was at 33 percent in 1983 but it more than doubled to 73 percent in 2003. The NAR of girls was 67 percent in 2003/04 according to the most recent household survey data. Because of the increase in primary school participation of girls, the gender parity index - the ratio of female to male NER or NAR values - grew from 0.4 in 1983 to more than 0.8 by 2003. If this trend continues, Nepal will reach gender parity in primary education in the coming years. However, additional progress is needed to reach the Millennium Development Goal of universal primary education by 2015.